A teen at boarding school grapples with life, love, and rugby in a heartbreakingly funny novel.Ryan Dean West is a fourteen-year-old junior at a boarding school for rich kids. He’s living in Opportunity Hall, the dorm for troublemakers, and rooming with the biggest bully on the rugby team. And he’s madly in love with his best friend Annie, who thinks of him as a little boy. With the help of his sense of humor, rugby buddies, and his penchant for doodling comics, Ryan Dean manages to survive life’s complications and even find some happiness along the way. But when the unthinkable happens, he has to figure out how to hold on to what’s important, even when it feels like everything has fallen apart. Filled with hand-drawn infographics and illustrations and told in a pitch-perfect voice, this realistic depiction of a teen’s experience strikes an exceptional balance of hilarious and heartbreaking. 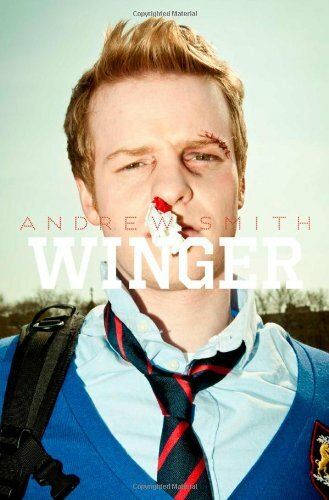 The book that I am reviewing is Winger by Andrew Smith. This book is about a boy named Ryan Dean West who goes to Pine Mountain Academy. A lot of interesting things happen at PMA. Read Winger to find out what. This book is about a group of people that are friends and do things together.